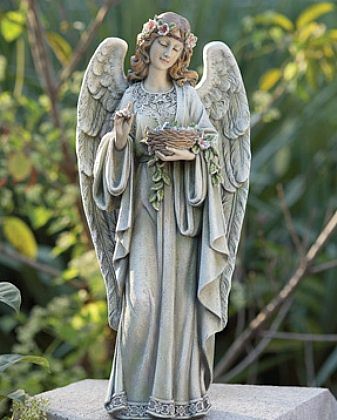 A beautiful angel girl, looking so dressed and with intricate details to her gown, holds out a little bowl to welcome the birds to the garden. She is also suited for setting a divine addition to the table or foyer where she will welcome those walking in with heavenly sweetness! Dimensions: 18"H x 8" x 5.5"